EVENT D: This 2-Headed Giant prerelease event for Magic: the Gathering War of the Spark will start at 11 am on Sunday, April 28th. Check-in starts at 10 am on the day of the event and we recommend arriving at least a half hour before the start time. Pre-register as early as possible to ensure your team's spot in this tournament. For the Two-Headed Giant format, players will register as a 2-person team and compete against other 2-player teams. Decks will be built out of 12 boosters total (2 Prerelease Packs), and partners will build and play as a team. Teams must arrive no later than 11:15 am. Teams arriving late will have less time for deck construction. Please allow time for nearby parking at the building may be full this date. FORMAT & PRIZES: Your Team will construct two 40-card minimum decks from your prerelease packs and play against others other teams in a 3-round tournament. 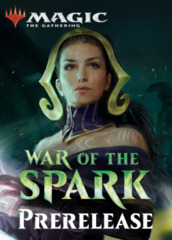 Prizes for all events will be awarded in War of the Spark booster packs but may also include additional merchandise such as playmats, deck boxes and sleeves. The event will run 3 rounds. Booster pack prizes will be awarded to teams who win at least 1 of their 3 matches. The Winning Team of each event will also receive a special GNG Prerelease Champion’s playmat (for each team member). 1.The name of each player on the team as well as a team name, if possible.